Hotel del Coronado's fine dining restaurant offers California coastal cuisine and pleasant ocean views. 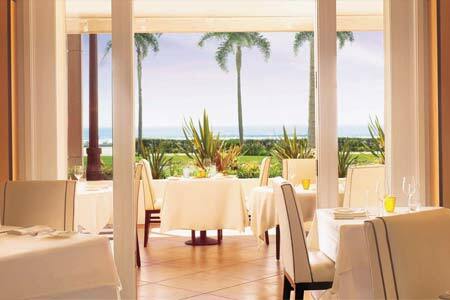 : This romantic seaside restaurant calls for an elegant meal at the Hotel del Coronado. Diners enjoy a tranquil setting, and whether you are seated outside or in the glass-walled dining room, views of the Pacific are a fine match for the California coastal cuisine that also pays homage to artisan ingredients, local farms and fishermen. Chef Meredith Manee has taken the reins and works under respected executive chef John Shelton. Starters include kale and apple salad with candied pecans; grilled octopus in roasted red bell pepper sauce; and poached white prawns with romesco and chorizo sauce. Entrées range from local golden spotted bass with spaghetti squash, shishito pepper and chorizo-clam broth, to braised pork shank with roasted persimmon, fennel and crushed rosemary potatoes. Herbs in the dishes are fresh from the property's gardens. The pastry chef has a deft hand, so don't miss desserts. Innovative craft cocktails and a California-centric wine list further elevate the experience.